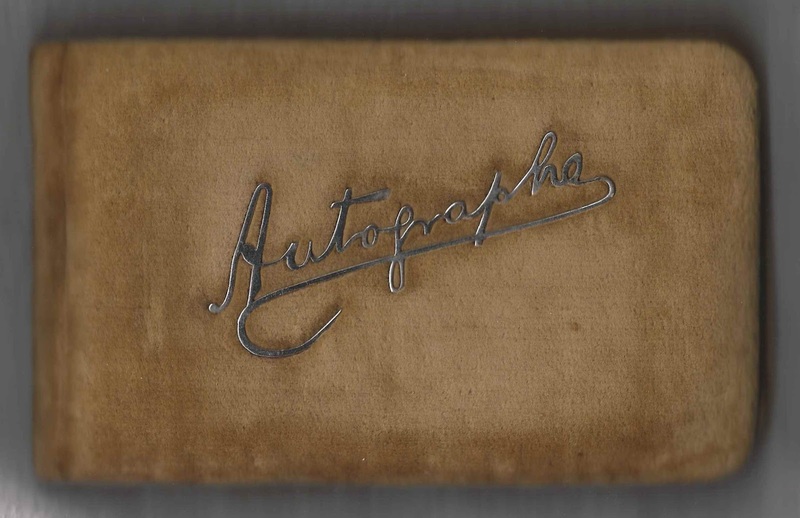 1885-1888 autograph album that belonged to Willard E. Demeritt of West Newfield, Maine. The album is approximately 7" x 4-1/4, with puffy covers, and contains the sentiments of 12 of Willard's relatives and friends. An alphabetical list of the signers, their residences and any family relationship mentioned, appears at the end of this post. Willard E. Demeritt was born about July 1860 at Bradford, Massachusetts, the son of David Jackson Demeritt and Hannah A. (Nason) Demeritt, who were born at Ossipee, New Hampshire, and, I believe, Newfield, Maine, respectively. 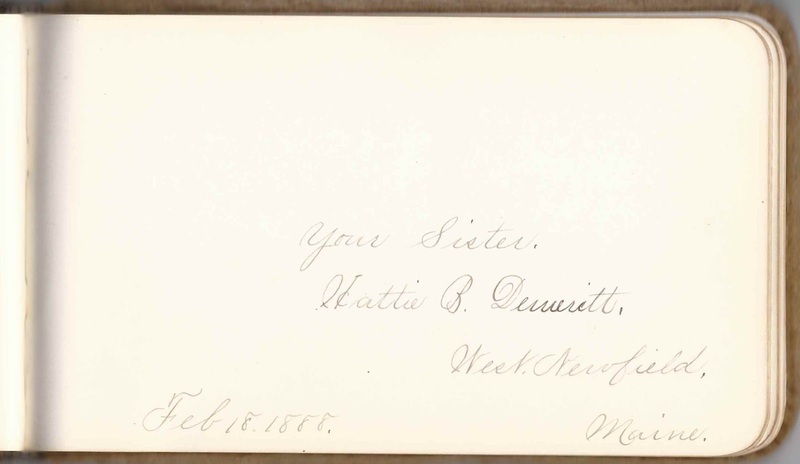 One of Willard's six siblings, his sister Hattie B. Demeritt of West Newfield, Maine, signed a page on February 18, 1888. Willard's cousin, Joseph R. Demeritt, signed a page at Boston, Massachusetts, on April 22, 1885. He was the son of James Monroe Demeritt, who was a brother of Willard's father, David Jackson Demeritt. 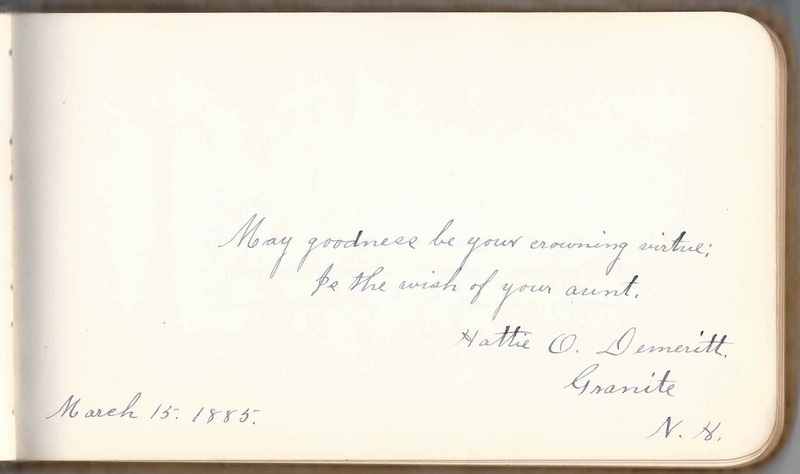 Willard's aunt by marriage, Harriet Oxnard (Metcalf) Demeritt, signed a page at Granite, New Hampshire, on March 15, 1885. "Hattie" was the wife of Calvin Sanders Demeritt, another brother of Willard's father, David Jackson Demeritt. On March 17, 1886 at Effingham, New Hampshire, Willard E. Demeritt married Laura J. Savage. Laura, the daughter of David and Jane M. (Hazlett) Savage, was born March 12, 1863 at East Boston, Massachusetts. 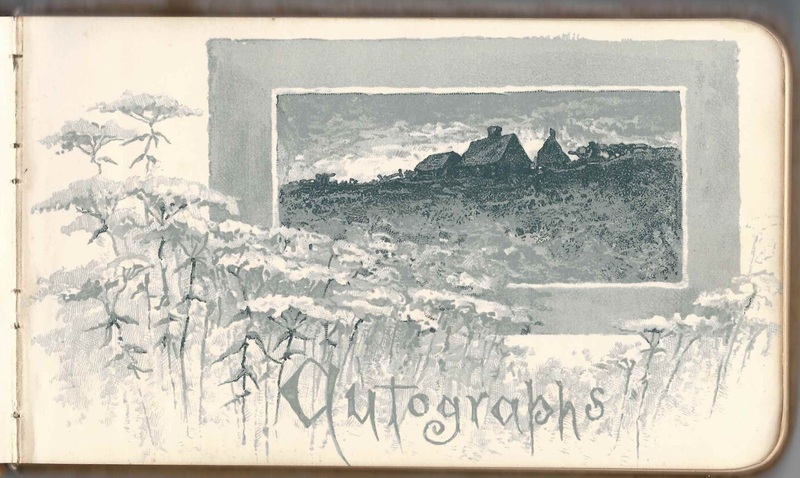 Before her marriage, on March 14, 1885 at East Boston, Massachusetts, Laura signed a page in Willard's album. 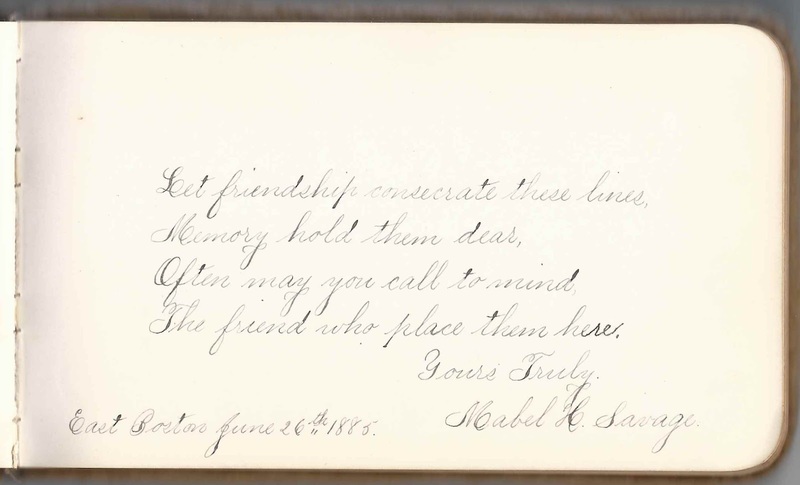 Laura's sister Mabel H. Savage signed the page following Laura's, at East Boston, Massachusetts, on June 26, 1885. Willard and Laura settled at Newfield, Maine, and raised, I believe, two children, both sons. Willard was a merchant. Hattie O. Demeritt of Granite, New Hampshire, signed on March 15, 1885; Willard's aunt. She was Harriet Oxnard (Metcalf) Demeritt, wife of Calvin Sanders Demeritt, who was a brother of Willard's father David Jackson Demeritt. Hattie B. Demeritt of West Newfield, Maine, signed on February 18, 1888; Willard's sister. 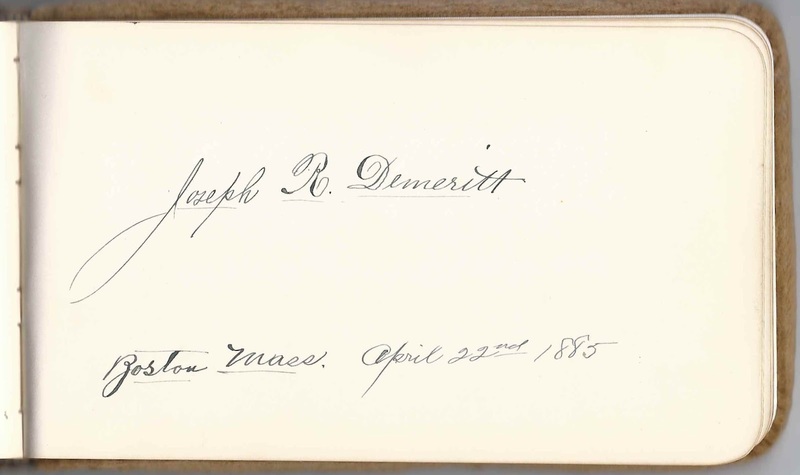 Joseph R. Demeritt, signed at Boston, Massachusetts, on April 22, 1885. He was the son of James Monroe Demeritt, brother of Willard's father David Jackson Demeritt. 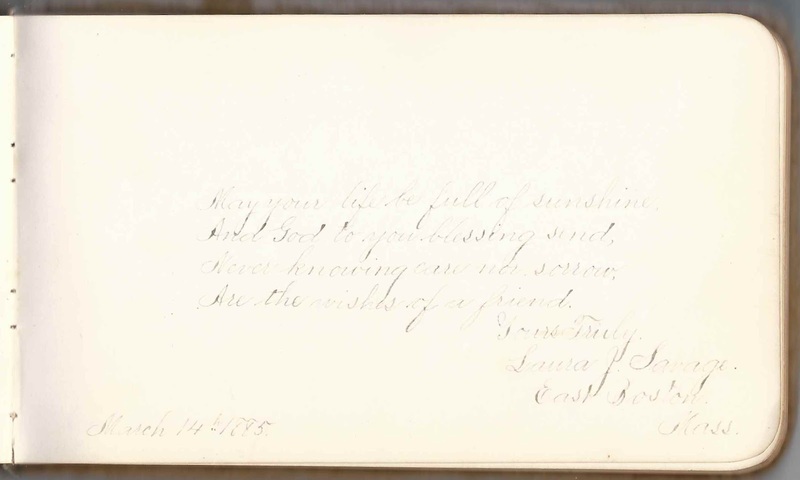 Ida M. Kenison of Granite, New Hampshire, signed on September 17, 1885; "G.S.S." or "G.T.T." Ida M. Metcalf of Lewiston, Maine, signed at Ossipee [presumably New Hampshire] on September 5, 1886. She was the daughter of George W. Metcalf, brother of signer Harriet Oxnard (Metcalf) Demeritt, "Hattie". Laura J. Savage of East Boston, Massachusetts, signed on March 14, 1885. She and Willard E. Demeritt would marry at Effingham, New Hampshire, on March 17, 1886. Mabel H. Savage, signed at East Boston, Massachusetts, on June 26, 1885; sister of Laura J. Savage, Willard's future wife.